If you have bad credit, but really need financing in order to purchase a new or used auto, you’ll benefit from learning about zero down car loans. These “bad credit car loans” are designed to help people just like you to access new or used rides, without the usual (and sometimes astronomical!) down payment. In order to help you get the inside scoop on zero down car loans with bad credit, we’ve created a factual and informative quick guide. What are Zero Down Car Loans, Anyway? Zero down car loans are auto loan financing options which don’t necessitate down payments. Since these loans are just so affordable, they appeal to many prospective auto owners. However, in the past, getting this type of “no down payment” loan would be tough if you had a poor credit history. Unfortunately, many people do have less than perfect credit scores. In order to qualify for a “basic” zero down auto loan, you’ll need to produce some paperwork, such as pay stubs or (for the self-employed) tax returns. During the application phase for this sort of loan, you’ll be contacted by an auto finance lender, you’ll likely be asked questions about your credit score. Because of this we have partnered with a company to provide you a FREE credit score in just minutes! There are lenders who are happy to extend this form of credit to those with less than perfect credit! 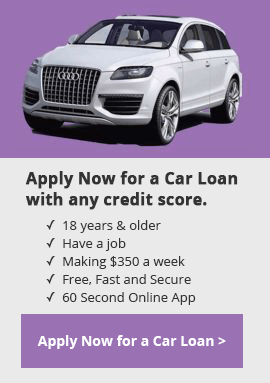 Another convenient option is applying for this type of auto loan online, and this option is becoming a popular method of accessing financing, since it allows prospective borrowers to apply for loans, right from the comfort and privacy of their own homes. If you enjoy doing business online, applying for this sort of loan via the Web may be extremely convenient. You can even apply from mobile devices, such as smart phones and iPads. Applying for this sort of loan online will also allow you to access a fast response about the status of your application. Some lenders will give answers about loan applications within just 24 hours. If you want to speed up the process of getting an answer about this form of loan, you’ll benefit from filling out an online application, as it’s really the fastest way forward.